OAKLEY, Calif. — It may have lacked the confetti, streamers, and the pomp and circumstance of last year’s championship celebration, but it was a victory nonetheless for the Senior Bro, who hoisted the Surfy Trophy high for the fifth time in six years. Unlike the 2017 trophy presentation to honor Sean’s first title after a four-year drought, it had been little more than one trip around the sun for Glenn, who concluded that memorable ceremony by telling his brother not to get too comfortable with the Surfy because he wanted it back next winter. Despite having to come from behind to win the prize late in the season, on this day his wish came true. “I really didn’t think I’d be winning this back this year,” Glenn said following the brief trophy-passing event that included only the briefest of introductions — Tina Turner singing a canned rendition of “The Best.” True enough, Glenn had to climb out of a four-game hole he found himself in at the end of Week 12. But he then stitched together a six-split winning streak that led to his ultimate victory. A kiss of the golden statuette and some minor polishing, and the Surfy was soon back in its spot in the living room. Glenn barely had to blow the dust off the shelf, it had been so short an absence. While the 2018 Surfy Trophy presentation may not have been the most memorable in GBF history, four out of four people on hand for the ceremony said it was easily more entertaining than this year’s low-scoring Stupor Bore, won by New England over the L.A. Rams, 13-3. 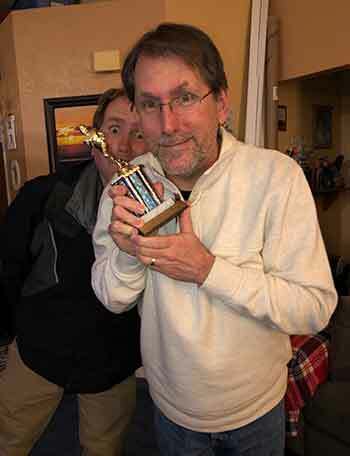 One of the closest GBF seasons in recent memory came down to the wire in Week 17, and when the dust settled it was the Senior Bro reclaiming the championship he relinquished a year ago. Glenn entered the final week of the regular season with a scant 1-game lead in the Surfy standings, but following a stumble the previous week he said it was an advantage that didn’t feel like one. That is because much of this season found Glenn close but always trailing until he finally claimed the lead for good in Week 15. There was always the possibility that the Bros could find themselves tied at the end of the regular season, having to extend the weekly predictions into the postseason for the first time in more than two decades. But on Sunday, it immediately became clear there would be no ties. The Bros wound up with two splits to settle things, and for Sean to retain his trophy it would mean having to sweep them both. The Junior Bro’s quest began with promise during the first split, when Tampa Bay jumped out to a 17-0 lead over visiting Atlanta in a meaningless game. But the Falcons got their offense going behind the stellar play of their star quarterback Matt Ryan, who in addition to tossing two touchdowns also caught his first one ever as a receiver. And it was kicker Matt Bryant who booted the deciding field goal with no time remaining as the Falcons won, 34-32. With that kick, the nail biting was over and the Senior Bro’s championship was in hand. Had things worked out differently in that game, the final outcome would have been the same, for in the afternoon game it was the NFC’s second-seeded Rams easily defeating the 49ers, 48-32, for the second time this year. And by virtue of the fact that Glenn picked up the sweep Sean had needed, he closed out the season with a 3-game margin, his largest lead of the year. Glenn knew he needed to have accurate predictions in Week 17 if he hoped to win the title, and he mostly accomplished that, compiling the best record at 12-4. Sean and Ben tied for second at 10-6. Our mutually correct predictions included Baltimore, Houston, Kansas City, New England, Pittsburgh, Philadelphia, Seattle and Indianapolis. We all missed the wins by Detroit, Carolina and Dallas. SNOOZIN’ TO A BRUISIN’: It would be hard to match the sizzling 67.2 percent accuracy rating set by Sean in last year’s campaign, and the Bros didn’t. Glenn won the season with a 164-90-2 mark for 64.5 percent. That coincidentally is identical to his numbers in 2016, the last time he won, and an 8-game improvement from last year’s 157-99 (61.3%). Sean was 161-93-2 (63.3%), 10 games down from 172-84 (67.2%) in 2017. Ben holds the dubious distinction of not only finishing 38 games back in last place, but at 126-128-2 (49.6%) he also closes out the season below the .500 mark, dropping 3 games from last season’s total of 130-126 (50.8%). We’ll all be rooting for King Chaos to turn things around next season! WHAT HAPPENED TO THE SPLITS? : Remember what we said about tame children? They don’t get much more tame than what we saw in 2018, as the Bros managed just 43 splits over 256 games, or just 16.8 percent. 15 of those came in the final four weeks as Glenn made his comeback. Overall he won 23 to Sean’s 20. There were 59 splits last season. It is the lowest splits total in 10 years, since we saw 49 in 2008. There was at least one split every week, with six featuring an even number and the remaining 11 being an odd number. The most splits in a single week was five (Week 16). 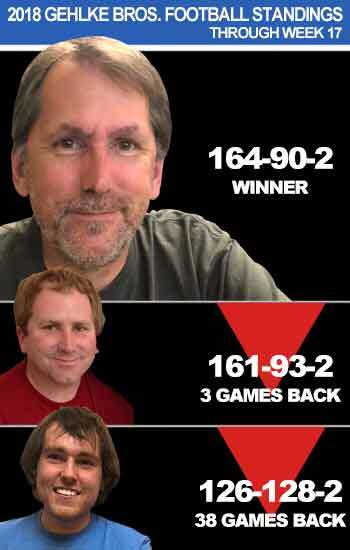 Five weeks saw just one split, with Glenn winning three of those. Just two of the even-split weeks ended in a tie. A STREAK OF WINNING WEEKS: Win more weeks than your opponent and you’ve got a good shot at winning a title. Glenn accomplished that in 2018, winning 7 weeks and tying in three. He finished above the .500 mark in every week, a streak that began in Week 10 of last season. Glenn’s best week was a 12-2 mark in Week 8 — the same week that Sean hit 13-1 for the best record overall in 2018. Glenn’s worst mark was a 7-6 in Weeks 9 and 11. Sean, meanwhile, was 6 wins and 2 ties for the season, and Ben was 1-1, notching his only winning week in two years with a 10-3 finish in Week 11. On the flip side, Ben saw his worst week at 4-12 in Week 3. Sean’s worst week was 6-7 in Week 11. OWN THE NIGHT: There were 51 games that qualify for “night game” status, and we split 15 of them, or 29.4 percent! Glenn won nine of those, mostly on Thursday where he went 4-1 on splits and 12-3 overall. There were eight Sunday night splits, and despite that the Senior Bro went just 9-8 there overall, he broke even in the split games with four apiece. The Bros also split the two Monday night splits. FROM CHICAGO TO NEW ORLEANS: Last season we began tracking our best and worst performing teams. Like stocks, some are perennial winners for you while others consistently disappoint when you invest in them. Glenn’s most successful pick by far was Chicago, which figured prominently in his late season rise from the ashes. The Senior Bro went 12-4 with the Bears, winning all four splits involving them between Weeks 10 and 16. Second was Tampa Bay, with a 13-3 record and a 3-split sweep, including the one that decided the championship in Week 17. For Sean, New Orleans was in his hip pocket. The Junior Bro was 13-3 with the Saints, sweeping all five splits. His runner-up was Washington at 12-4 with wins in all three splits. Four teams tied for most splits: Carolina, Kansas City, L.A. Rams and Pittsburgh. There were two teams that we did not split at all: N.Y. Giants and Tennessee. TIGHT SPREAD, BIG FINISH: At the ceremony in which he surrendered the Surfy Trophy after a four-year run of success, Glenn told Sean he shouldn’t get too used to it because he wanted the statue back next year. But to reach that goal would mean having to buck a trend that had held since 1999 — the last time a defending champ was dethroned the season after he reclaimed the Surfy. And for most of the 2018 season it appeared Sean would keep the streak alive. 2018 will be remembered at the year of few splits and close competition most of the way. Sean took a 2-game advantage in the opening week and spend the first 14 weeks either out front or tied, only hitting his widest margin of four games on a Thanksgiving weekend in which he swept three splits. That Week 12 meltdown was the point at which Glenn thought his season was finished and from which he embarked on another remarkable rally with shades of his 2013 title. Over the next three weeks the Senior Bro won 7-of-8 splits, turning a 4-game deficit into a 2-game surplus at the end of Week 15. But the comeback stalled in Week 16, when with five splits at stake Sean captured three of them and pared a game off the lead. Glenn felt the sting of that loss more acutely when he failed to pick the Raiders on Christmas Eve in their victory over the Broncos — an outcome he had predicted before the start of the season but didn’t execute on because he was afraid of the consequences had he been wrong. The Broncos-Raiders miss proved to have no lasting damage, however, when Glenn went 12-4 and swept a pair of splits in Week 17 to secure his championship by three games, extending his current run of success to five titles in the past six years. That is still a long way from Sean’s dominant run of 10 championships in 14 seasons from 1999-2012. The 3-game margin of victory was the slimmest since Sean won the Surfy by a single game in 2008, overcoming a much larger deficit in the closing weeks. It’s difficult to single out any one game that led to a winning season, but for Glenn there were several pivotal moments in 2018 that included the Week 2 Thursday night win by Cincinnati over Baltimore; Cleveland’s comeback against the Jets the following Thursday night when Baker Mayfield made his debut to snap a 19-game losing streak; New England’s Sunday night victory over Kansas City in Week 6; and the Chargers’ 2-point conversion to defeat the Chiefs on a Thursday night in Week 15. He will no doubt also long remember the ones that got away, including Cleveland’s come-from-ahead defeat in OT at Oakland in Week 4; Justin Tucker’s missed PAT that cost the Ravens a shot at overtime against the Saints in Week 7; and the epic 54-51 shootout between the Chiefs and Rams in Week 11. That concludes another exciting season of Gehlke Bros. Football picks, so until the trophy presentation we’ll be eager to watch what appears to be one of the most unpredictable postseasons in years. Can the Saints win it all? Or will some upstart like Chicago return to the pinnacle of NawFuL success. See you again in September! You are visitor since September 21, 1998. © 2018 Gehlke Bros. Football. All rights reserved. Hey, you're on the goal line, why not go for the 2-point conversion!